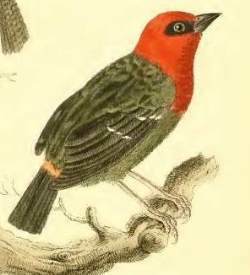 The Mauritius Fody was formally named by Johann Friedrich Gmelin, a German naturalist. Gmelin described many new bird species in a book in 1789 in the style of Linnaeus' publications, giving a brief description in Latin and a synonomy, including a reference to the coloured engraving by Francois-Nicolas Martinet in the book edited by Edme-Louis Daubenton. The illustration in Daubenton 1783 is of a male, and the first female to be painted, but Buffon does not appear to have written about it. Gmelin noted the locality for the Mauritius Fody as "insula Franciae". 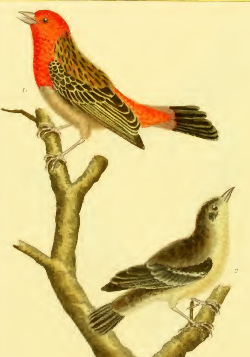 Gmelin 1789 (p903) also described Fringilla erythrocephala, based on the first illustration of the Mauritius Fody, ie. by Peter Brown, an English naturalist and illustrator. Gmelin did not realise that the same species was involved, due to the slight differences in the artwork. The Latin name he provided here was invalid. Gmelin noted the locality for this Mauritius Fody specimen as "insula Mauritii". Peter Brown was the first to illustrate, the Mauritius Fody. He called it the Red-headed Finch and gave a description of the bird. Brown notes that his specimen was in the collection of Marmaduke Tunstall, an English ornithologist and collector. The fody would have been brought by ship from Mauritius to England, where it would have been purchased by Tunstall. Brown's painting appeared before that of Daubenton, but these paintings were probably based on different specimens, so all that can be said about the collection details is that the type specimen was taken before 1783 by an unknown collector. This is the last weaver described by Gmelin. Emberiza rubra	Gmelin 1789 Syst. Nat., 1(2), p.877	Isle de France [=Mauritius]. 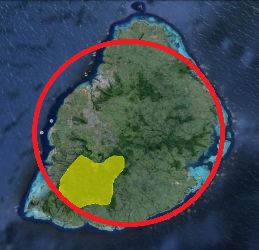 insula Franciae= Mauritius. The historic distribution of the Mauritius Fody ranged over much of Mauritius, so the type could have been collected anywhere on the island. Type specimen not located; the illustration of Daubenton 1783 serves as a type.